Recently reflecting on the death of Alfie Noakes, our accomplished Brylcreemed left back of the 50s, Iain Gordon began to think we do not pay proper tribute to our stars of the past. It is true though that more effort has been put in recently by inviting ex players back to the club on significant occasions. 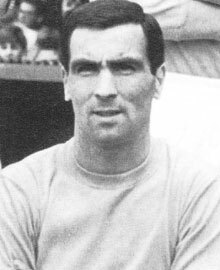 It is said that Peter Simpson, probably the best ever Palace player, was bitter about his rejection by the club. He even ran a newsagent's on Spurgeon's Bridge, Croydon, after retirement but never had any latter connection with the club for which he scored 166 goals in 195 matches in the early 30's. How sad is that? The greatest ever player in my lifetime was undoubtedly Johnny Byrne. When he died there was a short obituary in the Croydon Advertiser and the club now have a tiny little corporate entertainment room dedicated to him in the Members' Stand. It doesn't even have his name on the door. Shame on the club and Croydon Council for not recognizing the contribution those people made. If other clubs and areas can do it, why can't we? Few will think of Peter Burridge, another gem we stole from Millwall in 1962. All in all we have had much the better of the exchanges with our poor neighbours over the years and Burridge was one of the best. He does not feature in any of the lists of greatest players, legends, stars, heroes, or whatever you want to call them. For me though, he is all of those. To be fair, even at the time, the Palace supporters did not particularly warm to him and, after he retired, whilst working as a publican in Sawbridgeworth, Hertfordshire, he even wrote to the Advertiser bemoaning the attitude of the fans. The problem was that he appeared indolent and seemed to stroll about the park in a casual fashion, but didn't all the good players of that era? He had a great eye for a goal though and scored 50 goals in 124 games between 1962 and 1965. That was only slightly less than the revered Cliff Holton who features in all the above accolades. Burridge can be best described as a typical old style inside forward, in the John White mould, not tall, slight and wiry in build. He would appear to amble around aimlessly some of the time but would then burst into action with a deft pass, a subtle flick or a blistering shot. He also had great heading ability. I remember one particular game when he was getting stick from the crowd and from one man in particular standing beside my friends and me. We were busy extolling his virtues when our hero picked up the ball just outside the penalty area, produced a sublime piece of skill by feinting to pass out to the right wing then completely surprising the goalkeeper by clipping the ball just inside the far post. Wherever you are now Peter, I salute you.